Last fall, Sesame Street and Nat Geo debuted the first interactive television shows using the Xbox 360’s Kinect camera and motion control technology. Kids loved the new format (check out our impressions here), and now both shows are back for a second season. 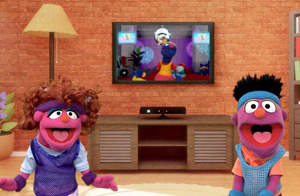 “Kinect Sesame Street TV” episodes combine Sesame Street standards such as the number of the day with lots of physical activity like jumping, dancing and clapping. One of the best segments, “Grovercize” has Grover guiding kids through his own silly exercise class. Other features include one-on-one conversations with characters Telly and Elmo about feelings, plus songs, counting and letter recognition. In “Kinect Nat Geo TV” season two, families can learn about the world’s coolest reptiles with Brady Barr, host of Nat Geo’s “Dangerous Encounters.” Viewers can develop naturalist skills, learn about the environment and get to know favorite wild in 30-minutes episodes. Each has interactive activities called “Side Tracks” that let kids play games and do more exploration. Both shows have eight, 30-minutes episodes in Season Two. Through Xbox LIVE exclusively, you can download all eight for $29.99 through or $4.99 per single episode.